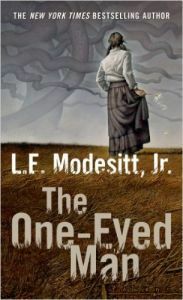 The Science of Fiction: Book Review: The One-Eyed Man by L. E. Modesitt, Jr.
Book Review: The One-Eyed Man by L. E. Modesitt, Jr.
A couple of years ago I read Adiamante by L. E. Modesitt, Jr.. It was the first of his books I’d read and up to that point I hadn’t realised he wrote Science Fiction, having only seen his fantasy books in the past. The One-Eyed Man, subtitled A Fugue, With Winds And Accompaniment, was published in 2013 but I ended up reading it now mostly on the strength of Adiamante.